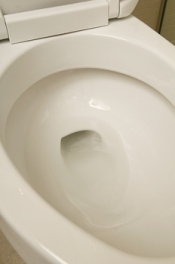 Inside a typical home, about 40% of the water used is due to toilet flushing. Do you know that the City of Daytona Beach sponsors a rebate program that encourages residential water customers to replace older, inefficient toilets with new, low-flow models? If you qualify, you will be credited $50 on a future water bill. This water conservation project has been very successful and is directly responsible for saving more than 1 million gallons of water per year that otherwise would have been flushed away. The address of the residence must be within Daytona Beach city limits. The toilet that is being replaced must have been manufactured prior to 1992. 1992 is when the National Energy Policy Act went into effect, mandating that toilets be manufactured to use only 1.6 gallons per flush rather than the 3.5 – 7.0 gallons per flush of older models. The toilet replaced cannot be reused and must be disposed of properly. After receipt of all paperwork, eligible participants will be credited with a $50 rebate on their water bill within four to eight weeks, depending on the billing cycle. This is a residential rebate offer and is limited to two toilet replacements per address. For commercial requests, please call (386) 671-8821 for details. By participating in the City of Daytona Beach’s Toilet Rebate Program, the customer agrees to an installation verification visit, if requested by the city.